July 4th is the day that Americans celebrate their Independence Day. This day marks the founding of a new nation, the United States. Nowadays, it is marked by a range of fun events such as parades, picnics, barbecues, and, of course, fireworks, but the day's origins should not be forgotten - Independence Day itself, and the period before it, provides a wonderful chance for and parents and teachers to educate children about history. A game of bingo is an interesting idea to mark this holiday. It is played in almost exactly the same way the standard version of bingo, but with one simple change: instead of playing with the normal bingo cards containing numbers, the game is adapted for the holiday by using special cards that have been printed with words or phrases that tie-in with the holiday. 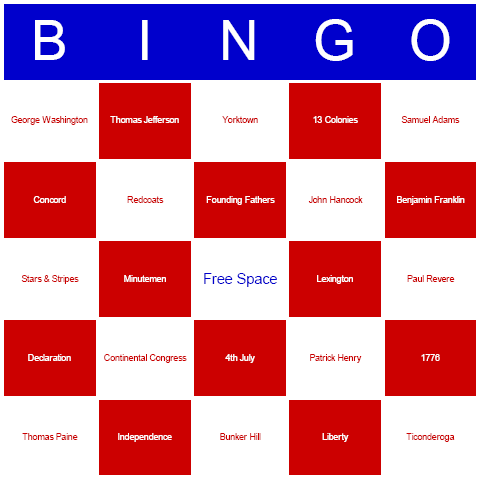 If you would like to organise a game of July 4th bingo, the key requirement is going to be getting a set of bingo cards printed with the words and phrases that relate to the July 4th . While it may be possible buy some ready-to-use cards but they might be expensive and you could find that such bingo cards do not contain the items you want anyway. Therefore, it might be better to print-out the cards yourself, with the help of your computer. This process may be actually easier than you might think: All you need to do is download a bingo card maker program, and you can get the job done in a few minutes. Finally, one last thing worth mentioning is that July 4th bingo can also be played ESL/EFL (English as a Second/Foreign Language) education. Not only because it is highly enjoyable, but also can be highly educational.